Part one of this post featured the stakeholder map. For those who want to cast the net wider when identifying stakeholders two possibilities are online surveys and email data mining. But it may be more useful to just get started and regard the stakeholder map as an iterative process. Stakeholder mapping is one of the first things to do when formalising your stakeholder engagement. 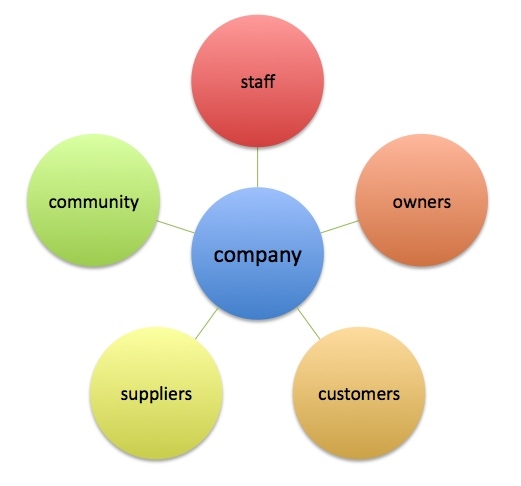 A stakeholder map as outlined in an earlier blog, is central to this process. I recommend that you keep the process as simple as possible and avoid over-planning or over-complicating the stakeholder mapping process. It can be initiated by a small of group of people, ideally with some external facilitation to ensure that the focus is on external stakeholders. Your initial attempts at a stakeholder map (or matrix) can be shared with others and updated accordingly. On the other hand, if you want to cast the net more widely a couple of suggestions follow. Identify two or three stakeholder groups that have some legal or regulatory influence on the work you do. Identify two or three stakeholder groups that you think are impacted by our operations. Identify two or three stakeholder groups that you believe we could create shared value with. Identify two or three stakeholder groups that might share our aspirations. Identify two or three individuals, external to our company, who you believe are most important to the sustainability of our company. The collated results will help to populate your stakeholder map. But avoid making the map too big. Use the same ranking system as outlined in the earlier post to identify your most relevant stakeholders. The beauty of using a tool such as survey monkey, is that the information will be collated for you. If possible, supply three text fields for each question, so the responses are easier to sort. Your techies should be able to provide a means to identify the domains most frequently used by your staff when emailing externally (hopefully its not ebay or Facebook :-). For example, which government department do we have most contact with? Or which of our suppliers do we generate most email traffic with? And a ratio of internal to external email will provide a raw indication of how externally orientated the company and its departments are. Can anyone suggest software that might achieve this? Remember, these two methods may give you a more complete picture for stakeholder mapping, but if they slow the process down, their value will be minimised. Make your stakeholder mapping an iterative process – its more useful to get out there and encourage other staff to get out there, and engage and revise the map as you go. This entry was posted in Stakeholder engagement, Stakeholder mapping, Sustainability and tagged corporate sustainability, engaging, Stakeholder engagement, stakeholder map, stakeholder mapping by Peter Bruce-iri. Bookmark the permalink. Hi Peter, I really like your point about identifying organisations that ‘share our aspirations’. It speaks to me of shared values, which I think are very powerful in building relationships of trust. I also think Survey Monkey is a great suggestion – evidence is an influential tool in stakeholder engagement, particularly with the internal powers-that-be. What do you think about a tool like this for stakeholder analysis and planning? This uses a collaborative team based approach to identifying and mapping out stakeholders. I like your questions sets about identify key stakeholders rather than necessarily having EVERY stakeholder. I would prefer using “engage” rather than “manage” as in “manage closely. Manage infers control while engagement to me is about creating shared value. With power and interest as the two axes the map is more suited to risk management than engagement. Is there a term that could replace power?